Manic Motherhood » Blog Archive » Pick up your shoes! This is the kitchen floor. It is a danger zone and apparently a substitute closet. Thanks to the dogs though, no food is on the ground. So there's that. Seriously, it’s not like I haven’t provided safe havens for their shoes. 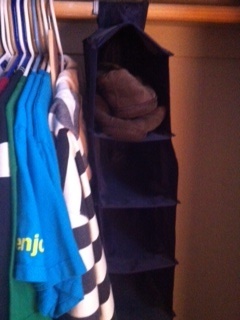 I have a nice organizer in Junior’s closet. Note the dust on the lonely pair of slippers in the shoe thingy. 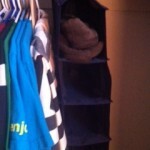 And I gave Harry a freaking shelf in our closet. That was a great personal sacrifice, people. He gets an entire shelf. (Well, minus the space I use for my Uggs and no, I don’t want to hear anyone’s opinion on my Ugg fetish; I’m old; I need furry shoes, deal with it). Anyway, back to my original thought – do Harry and Josh even use the provided shelf and organizer? No. They use the floor. What the heck is wrong with them? I have a billion more shoes than they do, and yet mine aren’t scattered all over the floor. No, mine live on their little shelves, waiting for me to take them out, stuff my fat feet in them and do stuff like walk. Or shop for new shoes. Or walk while shopping for new shoes. You know. Important shoe business. Ahem. Anyway, I’m open for suggestions on what to do about this. Because if those two don’t start picking up their shoes, I’m going to do something I never thought I’d do. I’m going to murder their shoes. It will be my own personal Stinky Shoe Massacre. Now where are my candle lighter and the BBQ starter stuff? OMG I totally relate! My son isnt two bad yet – he only wears one pair of his shoes so they are typically either under his bed or behind the couch. My husband on the other hand is the worst. He owns two pairs of boots and two pairs of sneakers. This is a typical week for me: Day #1 – husband comes home in boots and takes them off by the couch. (I leave them there for the day to see what happens) Day #2 – husband comes home in other pair of boots from the closet and takes them off by the couch. 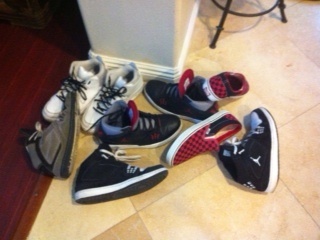 (I leave those there too) Day #3 – husband decides to wear sneakers and comes home and leaves those by the couch….you can see where this is going….so after day #4 he has used up all his shoes from the closet and has a mild attack in the morning saying “Honey!!! Where are all my shoes!?!?!? !” – Dork. I can so beat both of you!! I have the trump cards! Okay, Hubby ;s 2 pairs of boots,2 pair of tennis shoes, 3 pairs flip flops, 1 pair slippers Daughter,2 pair flip flops,1 pair tennis shoes,1 pair sandals, Son, 1 pair flip flops, tennis shoes, all placed at the top of the stairs by the banister. I tried to straighten them daily. Organize the shoe mats by the front door, and take extra shoes to the bedrooms. Does that help NO!!!!! Now, add in the habit of hubby and kids of stripping of socks and leaving them ALL OVER THE HOUSE! Under the couch, down the hall ways, living room. I even found one (just one) sock in my reusable shopping bags that “No body or I Don’t Know” tossed in, for my embarrassment at the grocery store. I am thinking I don’t know, Wasn’t me, and No Body are such little brats, their parents turn them loose on the rest of us. They are changelings! Like something the Grimm brothers wrote about before Americans found them too gruesome for our babies and made everything happily ever after. The Grimm brothers were doing a public service- writting the stories down as they were told for centuries, with the purpose of making kids behave before they were eatten, killed or lost to evil beings. Anyway- those three monsters need to be eligible as dependents on my taxes! They cost a lot in damages, utilities and groceries!